Pool water requires three things in order to be safe and enjoyable for swimmers: filtration, balanced chemistry, and sanitization. Sanitizers are a part of the chemistry, and their effectiveness depends on proper chemical balance. However, properly balanced water that lacks sanitizer is still unsafe for swimming, a breeding ground for bacteria and algae. Therefore, sanitization on its own is essential for pool water quality. The most commonly used and known sanitizer is chlorine. Chlorine comes in many forms and can be used as a daily sanitizer or a supplemental one to counteract algae and other problems. Some others include mineral sanitizers (the best supplement to chlorine) and ozone systems. However, the right level of chlorine can keep your pool safe and clear while not causing discomfort to the senses. The key is chemical balance and regularly monitoring the water for proper chlorine levels. The traditional way chlorine is added to the pool is via a variety of tablet dispensers. The tri-chlor tablets are 1”-3” in diameter and often have a stabilizer called “cyanuric acid” built into them. 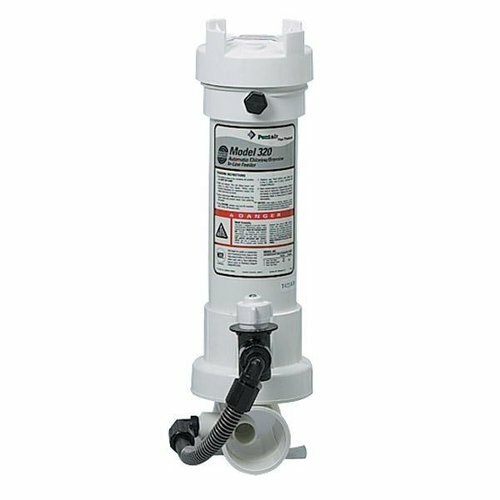 Floaters are the least desirable of dispensers, because they tend to hover over shallow horizontal areas like steps and benches. Thus, these areas become susceptible to damage from the acidic chlorine as the tablets dissolve. Also, children can easily swim into them or play with them as if they were toys, unaware of the intensity of the chlorine in and around the dispensers. Offline and in-line dispensers are installed at the equipment plumbing. Filtered water moves through tubes and into the plumbing system, where it is dispersed more evenly throughout the pool water by way of the return inlets. Of these two types, the in-line chlorinators are superior in that they are less vulnerable to freezing temperatures and sit in the piping; offline chlorinators are placed on the concrete and easily become a tripping hazard. A salt chlorine generator uses electrical charges to split sodium chloride (salt) molecules, freeing the chlorine to sanitize. You can typically adjust how much chlorine is released. Salt water pools are more comfortable for a swimmer’s skin. However, a salt system does not replace chlorine but the means by which chlorine is introduced. Salt water is very corrosive to metals and especially stone. While many believe salt systems are more cost-effective than traditional chlorine systems because of the high price of chlorine tablets, the fact is these systems involve very expensive and delicate components. The salt cells and boards have an average life of 4-6 years before needing to be replaced, depending on how often they run and whether proper but limited cell cleaning steps have been taken. Regardless of how your pool is sanitized, Select Pool Services personnel have nearly 40 years of experience dealing with problems associated with sanitization. 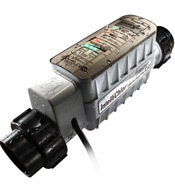 Whether you want to replace floaters with an in-line dispenser or have questions about salt water pools, contact us today to speak with a knowledgeable technician about your sanitization needs.